Tusculum College women’s lacrosse sophomore midfielder Calyn Kelly was one of two Pioneers ranked in the Top 10 in the 2015 NCAA Division II ground ball category. 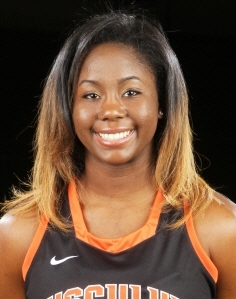 Kelly, a former Southwest DeKalb lacrosse and basketball star, had a 3.80 ground balls per game average to rank 7th in the nation and second in the South Atlanta Conference (SAC) along with freshman midfielder Madison Malone who was 10th with a 3.67 average led Tusculum to a 7th national ranking in team ground balls average at 24.80. 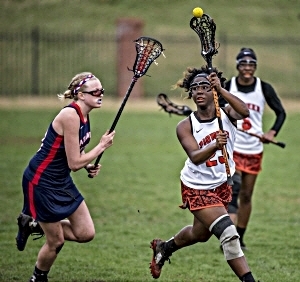 A transfer from Reinhardt University (NAIA) in Waleska, Georgia, Kelly was the first Southwest DeKalb Lady Panther to receive a scholarship for lacrosse. She also earned the Astroturf SAC women’s lacrosse Defensive Player of the Week for March 18-21 for her play in Tusculum victories over Catawba and Lincoln Memorial (LMU). Kelly recorded a season high nine ground balls in the Pioneers’ exciting 17-16 comeback victory over Catawba. Her season high five caused turnovers against Catawba included a timely defensive play that allowed Tusculum to run out the clock following the game winning goal. The Pioneers rolled to a 16-2 victory over Lincoln Memorial earlier that week had Kelly collecting four ground ball and three caused turnovers. The two-game span also included Kelly picking up five draw controls to aid her pick as the SAC Defensive Player of the Week. Kelly collected 16 goals and 9 assists to total 25 points as the tough defender finished sixth on the team in points scored. She had a team leading season total of 57 ground balls to go with 33 draw controls (ranked second on team) and 20 turnovers caused (tied for 4th on team). The daughter of Ernest and Vicki Kelly, Calyn is studying nursing with eyes on neonatal nursing after college.